How many times have you seen a dog owner stepping over a baby gate that's been re-purposed to keep the pooch from entering a specific room? 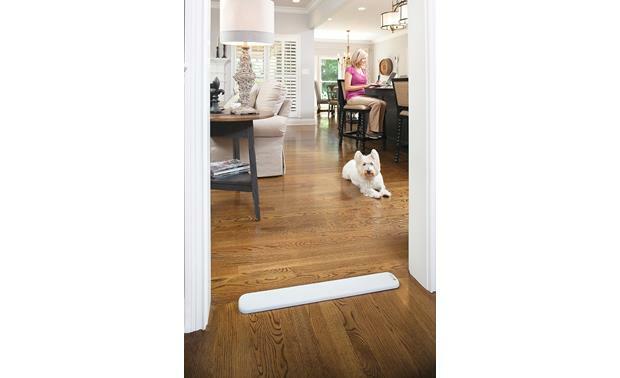 The Pawz Away Threshold Barrier can lie flat or mount horizontally to a wall or stair, so you can walk freely, but keep the dog in his own space. These two doggos know upstairs is off-limits, thanks to the Pawz Away Threshold Barrier. 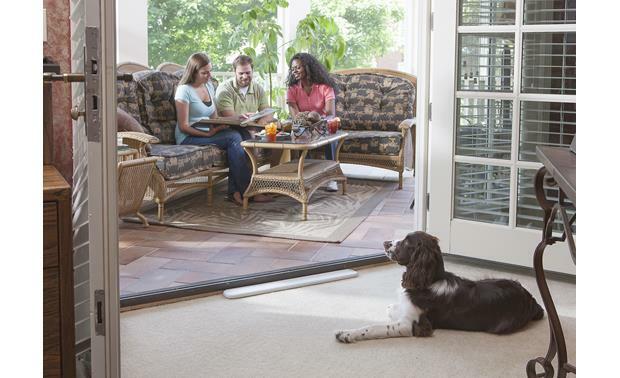 The Threshold Barrier comes with one receiver collar, but you can add as many as you need — each one will respond to the barrier strip the same way. When your pet approaches the strip, the collar will give a warning beep, followed by a static correction to remind your pet to stay away from sensitive areas like the baby's bedroom. If she continues past the barrier, she'll receive corrections from the collar until she backs away, or until the safety time-out activates after 15 seconds. Before long, she'll know exactly where the no-go zone is, and she won't test it. The collar receiver works with other PetSafe containment systems. A Pawz Away Mini Pet Barrier can keep poochie away from the couch or trash can. When you head outdoors, the collar device keeps them inside the perimeter of the YardMax In-Ground Fence. Can you get more than one collar if you only buy one of the blocks? I am trying to keep my dog in my room at times and my cat out. 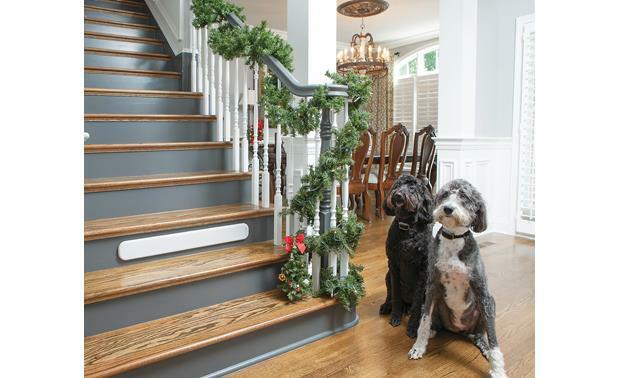 Overview: The PetSafe Pawz Away Threshold Barrier creates an electronic barrier to keep your pet from going up or down stairs, or from leaving or entering a room. The device transmits a radio signal to a receiver collar around your pet's neck to deter him from moving past the boundary. As your pet approaches the barrier, he will hear a series of beeps from the collar, and progressive static correction. 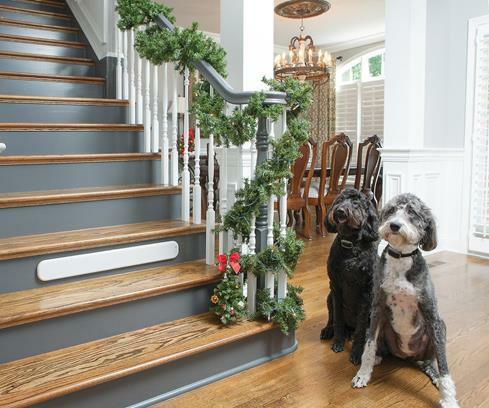 The Threshold Barrier replaces pet gates, so you no longer have to step over physical gates when going from room to room or up and down stairs. The package includes the electronic barrier and a receiver collar. Extra receiver collars are available for additional pets. Threshold Barrier: The 28" x 3.5" flat Threshold Barrier can be installed horizontally on a wall or stair riser, or placed laying flat on a surface. When mounted, the signal becomes very directional, especially directly above the unit. There are four range levels to choose from, allowing you to adjust the effectiveness of the barrier. The lowest level is effective up to 16", while the highest level reaches up to 36". The transmitter is powered by 4 "AAA" batteries (not included), and is designed for indoor use only. It can installed using the included screws or adhesive strips. Rubber pads in the center and on the ends prevent scratches. Receiver Collar: The Receiver Collar is a lightweight 3/4" wide nylon collar with a receiver with 1/2" long contact points. As your pet approaches the Barrier Area, he'll hear a series of audible tones from the Receiver Collar, and feel a safe progressive static correction, delivered through the contact points on his neck. This correction will continue until your pet leaves the Barrier Area. If your pet doesn't leave, the collar continues to correct at the maximum level for 3 seconds, up to the 15-second time-out. The collar fits dogs with neck sizes 6" to 28", or cats with necks up to 11.5", and can be trimmed to size. The collar and receiver weigh only 1.8 ounces, and is powered by two 3-volt CR2032 Lithium coin cell batteries (included). Yep! Extra receiver collars are available for additional pets (sold separately): https://www.crutchfield.com/p_4810013664/PetSafe-Pawz-Away-Extra-Receiver.html?tp=78777 For more details or to discuss further please feel free to contact an Advisor directly by phone (888.955.6000) or online chat. Thanks! can this be mounted vertically on a wall or doorway if placing horizontally on the floor is not an option? The Threshold Barrier can be installed horizontally on a wall or stair riser, or placed laying flat on a surface. When mounted, the signal becomes very directional, especially directly above the unit; which makes vertical mounting a challenge. For more details or to discuss further, please contact an Advisor directly by phone (888.955.6000) or online chat. Thanks! It's not very long. Can my dog go around it and it wont do anything? If there is enough room yes. And sometimes they run through. how many feet does this cover? Hi. Following up on unanswered questions. Range is up to 3 ft. There are four range levels to choose from, allowing you to adjust the effectiveness of the barrier. The lowest level is effective up to 16", while the highest level reaches up to 36". Hope this helps. 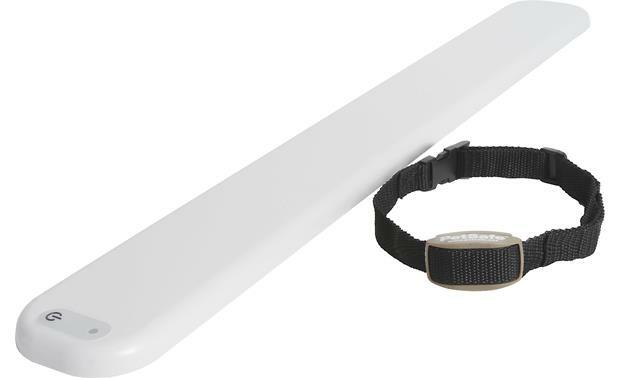 Searches related to the PetSafe Pawz Away® Threshold Barrier Dog training collar device and transmitter.